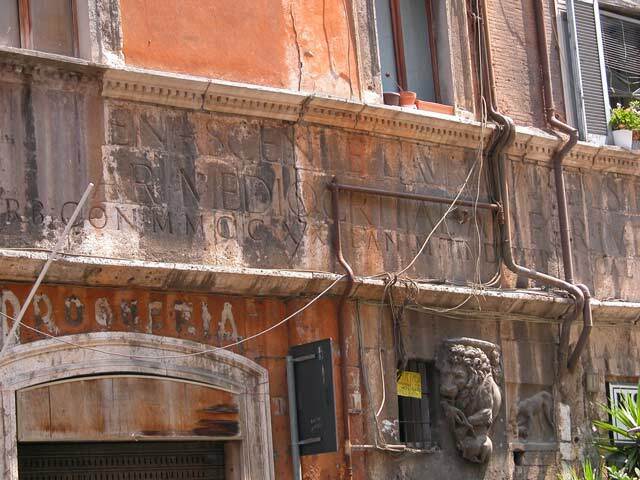 One of the most charming fountain of Rome is also one of the best hidden, and seeking it out will help you discover the Roman ghetto neighborhood and, why not, taste some dishes of the Roman Jewish cuisine. The “pièce de résistance” of this tour is the fontana delle tartarughe (The Turtles Fountain), located in the out-of-the-way Piazza Mattei, in the Roman Juish Ghetto . This lovely little fountain features four male figures propped up on dolphins and assisting tiny turtles into the small pool above them. It was built between 1580 and 1588 by the architect Giacomo della Porta (one of the most famous 16th century roman architects) and the sculptor Taddeo Landini. The bronzes turtles around the upper basin, usually attributed either to Gian Lorenzo Bernini or Andrea Sacchi, were added in either 1658 and 1659. 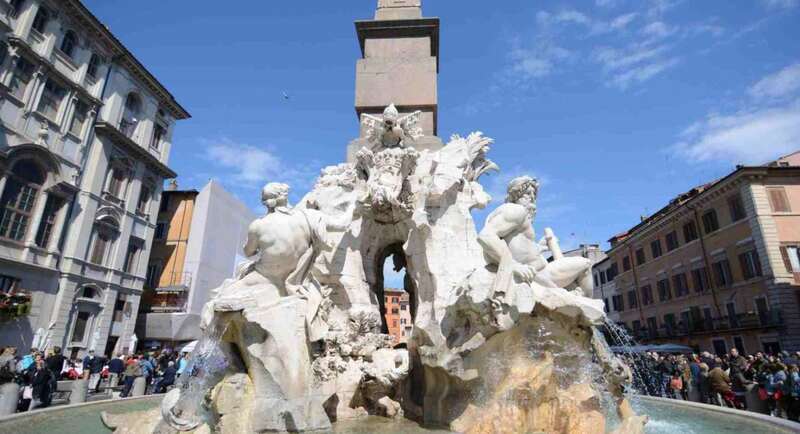 You will love this fountain not only for its beautiful late Italian Renaissance style, but also for the lovely and relaxed neighborhood, so different from the busy and chaotic largo di Torre Argentina square, which could be the starting point of your visit. 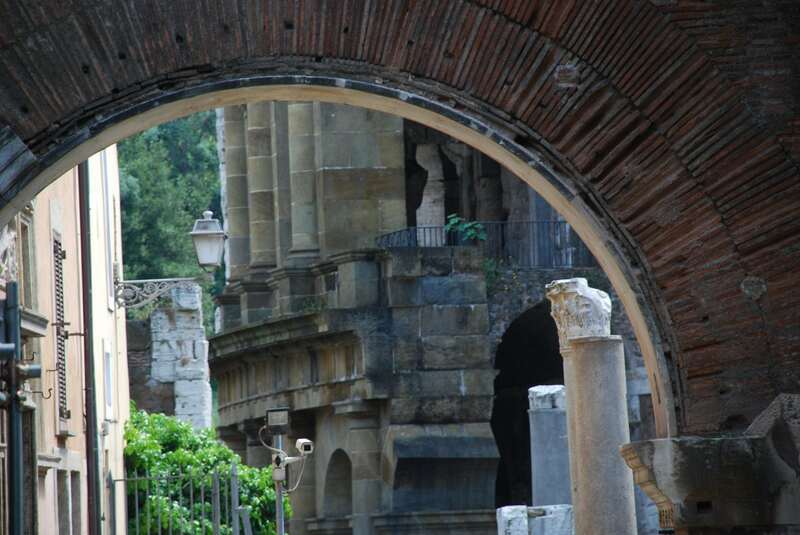 From largo di Torre Argentina take via Paganica and venture into the old neighborhood. 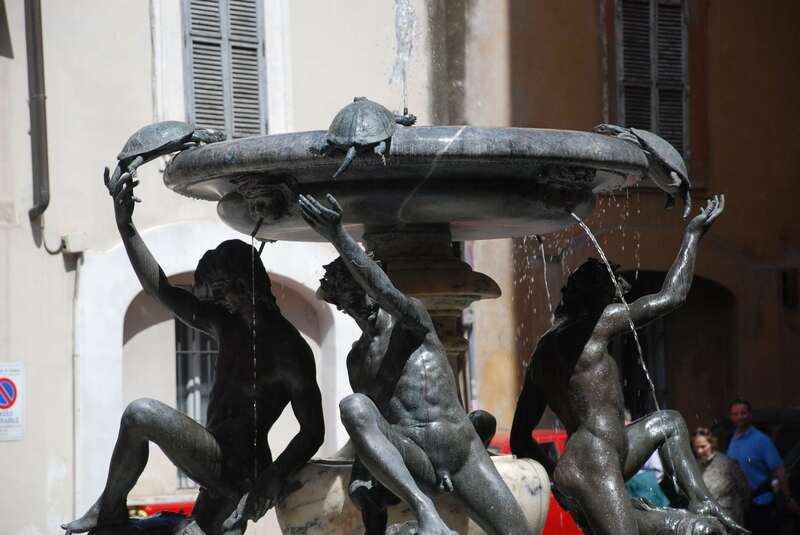 The Turtles Fountain is located in Piazza Mattei (from the name of the family who actually financed the fountain in the 16th century), at the end of via Paganica – you just can’t miss it. You can take your time, sit on a bench or sip a cappuccino in one of the two bars in Mattei square (I suggest the fancy Bartaruga). Then, lazily loose yourself in the old alleys or, if it’s lunch time, walk down the old via di S. Ambrogio, heading towards via del Portico di Ottavia, were most of the Kosher restaurants are located. 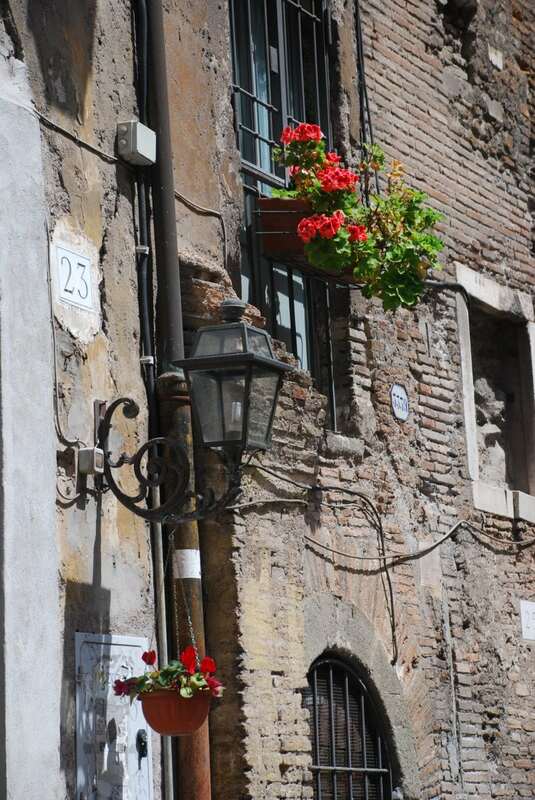 While relaxing and enjoying your walk, look for the remains or a very old past, that pop up from time to time in the old streets. 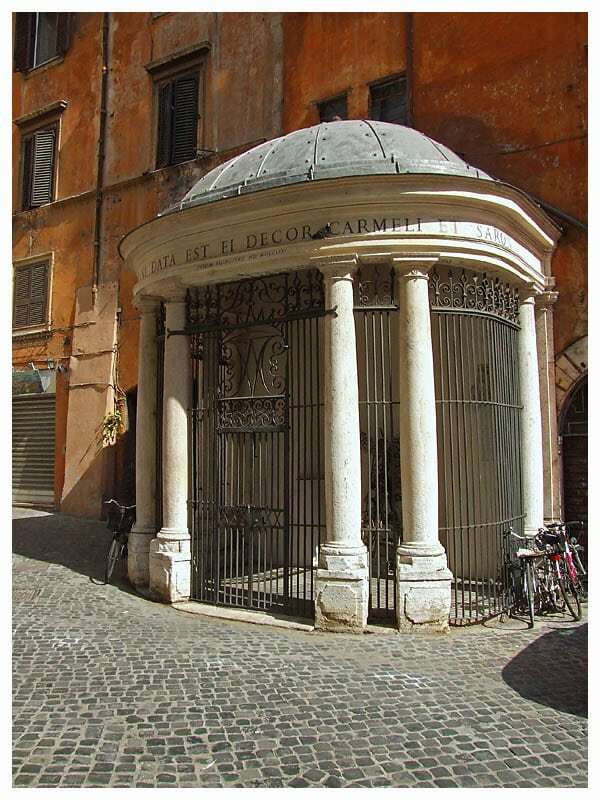 My favorite is the tiny and lovely Tempietto del Carmelo, build around 1572 by Pope Gregorio XIII; it was used to give local Jews “mandatory” sermons, with the aim of converting them to Catholicism! Also notable are the remains of Roman ancient buildings and statues, “recycled” during the middle ages as cheap construction materials. 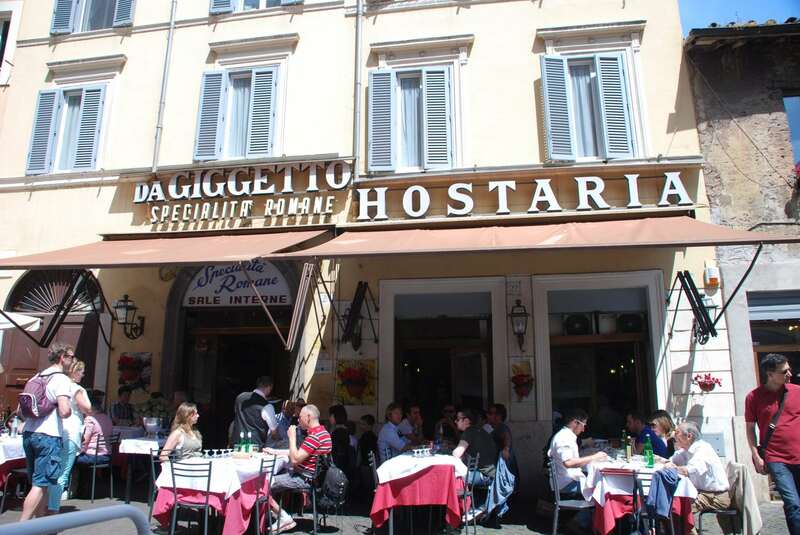 The most famous restaurant here is Gigetto al Portico di Ottavia, where you can eat on the side walk, with an amazing view on the Portico di Ottavia, the teatro Marcello and the Synagogue. 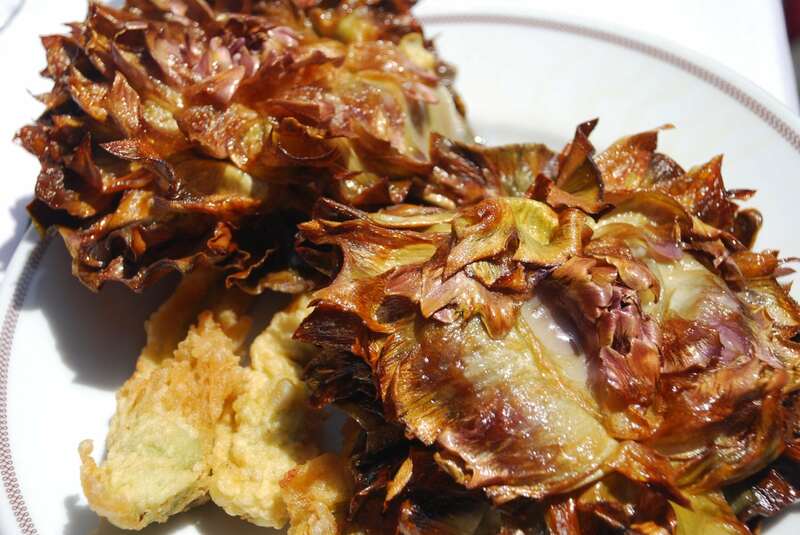 Here you can savor a delicious Carciofo alla giudia (fried artichoke, Jewish style). You should also taste “Fiori di Zucca”, delicious zucchini flowers, filled with mozzarella and anchovies and deep fried. Unfortunately Giggetto has become a tourist spotlight, and food level has suffered a little bit. For a higher quality you can also test Ba’ Ghetto or La Taverna del Ghetto, on the same street. Delightfullyitaly.com is the blog for all the ones in love with Italian culture, Italian sights, Italian monuments .. and with Italian food! If you wish to visit Italy for the first time, or if you already discovered Venice, Rome, Florence, the Amalfi coast, but still want more, delightfullyitaly.com is here to disclose to you Italian Must See as well as Italian hidden treasures. And if you like what you read, why not follow delightfullyitaly.com and get free updates?